In 1991, the first Copy General location opened overseas in Budapest, Hungary. Since then Copy General has expanded to five countries, more than 60 facilities and over 500 staff members. 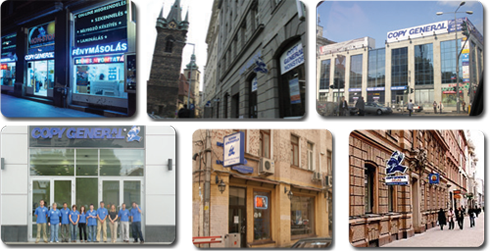 We are the leading provider of digital printing and copying services in eastern Europe. If you're planning a meeting or conference in Moscow, Prague, Warsaw, or Budapest we can make your life much easier. Deal with a name you know and trust. Click on this link to visit our English-language European home page. If you would like to speak with someone in the U.S., feel free to call Ken Chaletzky at (703) 478-5252 or toll-free at 1-800-736-COPY (2679).